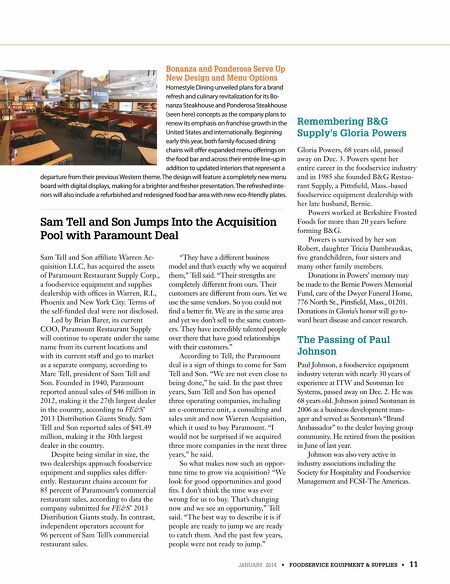 Foodservice by the Numbers 10 • FOODSERVICE EQUIPMENT & SUPPLIES • JANUARY 2014 people & events The percent by which hotel food and beverage sales will increase in 2014, according to Technomic. Hotels account for 10.1 percent of total on-premise food and beverage sales. 4.4 The number of locations Krispy Kreme plans to open in Taiwan during the next fve years. Fran- chisee Huan Hsin Co., Ltd. opened its frst Krispy Kreme location in Taiwan during December. 10 The number of locations take– and-bake pizza chain Papa Murphy's now operates system wide with last month's open- ing of its frst CREATE store in Phoenix. The CREATE locations feature an open layout that showcases the scratch-made dough prep area, hand-chopped vegetable toppings, and freshly grated cheese. A digital menu board enhances the guest expe- rience and provides a resource for local messaging. 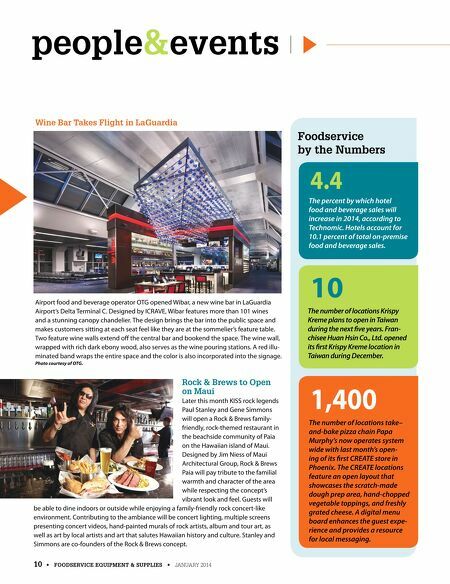 1,400 Wine Bar Takes Flight in LaGuardia Airport food and beverage operator OTG opened Wibar, a new wine bar in LaGuardia Airport's Delta Terminal C. Designed by ICRAVE, Wibar features more than 101 wines and a stunning canopy chandelier. The design brings the bar into the public space and makes customers sitting at each seat feel like they are at the sommelier's feature table. Two feature wine walls extend off the central bar and bookend the space. The wine wall, wrapped with rich dark ebony wood, also serves as the wine pouring stations. A red illu- minated band wraps the entire space and the color is also incorporated into the signage. Photo courtesy of OTG. Rock & Brews to Open on Maui Later this month KISS rock legends Paul Stanley and Gene Simmons will open a Rock & Brews family- friendly, rock-themed restaurant in the beachside community of Paia on the Hawaiian island of Maui. Designed by Jim Niess of Maui Architectural Group, Rock & Brews Paia will pay tribute to the familial warmth and character of the area while respecting the concept's vibrant look and feel. Guests will be able to dine indoors or outside while enjoying a family-friendly rock concert-like environment. Contributing to the ambiance will be concert lighting, multiple screens presenting concert videos, hand-painted murals of rock artists, album and tour art, as well as art by local artists and art that salutes Hawaiian history and culture. Stanley and Simmons are co-founders of the Rock & Brews concept.